(Seychelles News Agency) - Running late and don’t have the time to thaw and prep the fish you want to cook for dinner? Don’t have the time to stop at multiple shops to get the necessary condiments and vegetables to put the dish together. A new shop in Seychelles, Fishtech, could be your answer. Located in the business center of Anse Royale, a southern district of the main island of Mahe, the shop specializes in fish and seafood. Fishtech provides clients with whole fish, fillet and different other types of fish cuts. Clients can choose from a variety of fish from emperor red snapper, brown spotted grouper to sailfish. “We focus a lot on convenient products as a lot of people today live in apartments and they do not have an area to clean their fish,” said Jean-Claude Hoareau, the shop manager. Price of products starts as low as $1.80 for a kilo of chopped Varvara head. Hoareau told SNA that they do their best to place a slim profit margin in their product to unsure that they are affordable. 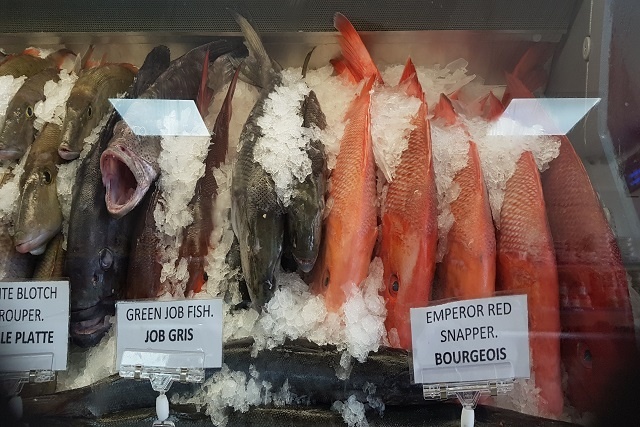 Before the opening of this shop at Anse Royale, the only other facilities providing clients with fish, value added fish products, and other seafood were Oceania Fisheries, and Sea Harvest, all located in and around Victoria – the capital city. “I think that such shops should be found all over Seychelles providing value added products. The service should not be limited only to fish - it should be extended to meat products and vegetables,” said Debra Port-Louis, a client of Fishtech. Port-Louis said that she is very pleased with both the service that the staff proves and the quality of fish and seafood that they sell. The shop opened on January 31 and the staff of the shop has had clients coming as far as from Bel Ombre, a northern district of Mahe. “Sales are going really well and that has been so since we started operations in January. Business peaks during the weekend and towards the end of the month,” said Hoareau. To ensure that there is a constant supply of fish even during the South East Monsoon when fish is scarce, the shop is equipped with three cold stores with the capacity for storing 20 tons of products each. With the spirit of providing their clients with an “all under one roof experience”, the shop has an area dedicated to spices and condiments compatible with fish dishes. Vegetables are also available. “Vegetables come from Jean-Paul's farm and a synergy exists between us,” said Hoareau. Fishtech is open from 9 a.m. to 6 p.m. from Monday to Friday and from 9 a.m. to 2 p.m. on Saturdays. It remains close on Sundays.